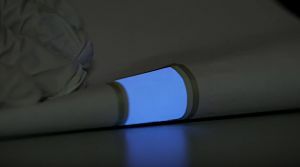 Convex and concave surfaces of paper, plastics and other materials can now receive a glow-in-the-dark coating, courtesy of a new process that allows the direct printing of electroluminescent (EL) coatings onto 3D objects. With the new process, any type of three-dimensional object can be provided with electroluminescent coatings at low cost, the German developers say. The production process is being developed by Germany's Karlsruhe Institute of Technology (KIT) in cooperation with Franz Binder GmbH & Co. Binder is a global supplier of circular connectors & cordsets for the automation and medical industries. The developers foresee potential in displays, watches, structural safety during power failures, and more. With the new process, "any type of three-dimensional object can be provided with electroluminescent coatings at low costs,” Dr.-Ing. Rainer Kling of KIT's Light Technology Institute said in a research announcement. Traditionally, luminescent material has been located between two plastic layers in EL carrier foils, allowing application only onto flat surfaces. With the new process, however, the layers are directly printed onto the object without any intermediate carrier. "In this way, convex and concave surfaces of various materials, such as paper or plastic, can be made [to] glow," the university said. Karlsruhe Institute of Technology (KIT) shows off its new 3D coating process. The different coating components, including the electroluminescent and the electrically conductive material, are applied with a pad printing process. The machine features an elastic rubber pad that confirms easily to curved surfaces, the team says. Various colors may be applied to the same surface. The process requires few steps and few resources, making it "possible to provide surfaces and even spheres with homogeneous coatings at low costs,” says engineer Elodie Chardin. “Homogeneity of the coating of about one tenth of a millimeter in thickness was one of the challenges of this project,” says Binder executive engineer Elisabeth Warsitz. The two-year-old project has been partially underwritten by the German Foundation for the Environment. Testing will continue beyond the prototype stage, officials said.